Wonderful for winter, and unbelievably good over pasta, then topped with portobello mushrooms or bacon. Please everyone in the house with this flexible veggie or carnie recipe. First, a photo of the dish. And then a little explanation. Okay, I lied. Two photos. Because one is for carnies (of the carnivore, not carnival variety), the other, for veggies. See: Bacon above. See: Portobello mushrooms below. 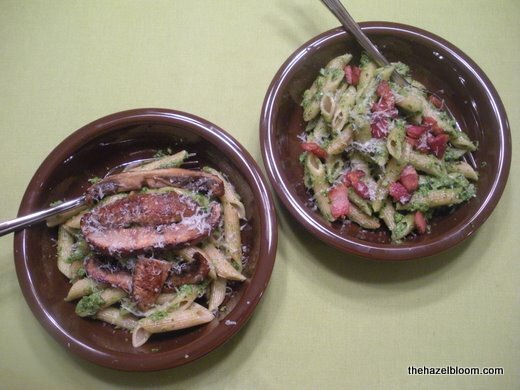 And pasta, in both dishes, tossed in a terrific, vibrant pesto made of spinach and walnuts. It’s the oddest thing. If you’re like me, it goes something like this. You make a bunch of basil pesto. You snack on the pine nuts while making it (always a very important step). You eat some pesto. Two or three days later, you start getting this really horrible, metallic taste in your mouth after every meal. It starts to freak you out so much that you google “metallic taste in mouth” and before long you come to a forum in which thousands of people have participated, and they’ve all experienced these symptoms starting two to three days after they’ve eaten pine nuts – especially from certain countries. It’s kind of a mysterious affliction and one that no one seems to have really taken seriously, but when you Google “pine mouth” you may be just as surprised as I was. Soooo… yeah. I know. It sounds weird. Even though I think I had a minor case – I experienced the symptoms for just a few days – I’ve been avoiding pine nuts since. But lately, I’ve been thinking about pesto. And so I decided to make spinach pesto. With walnuts, dangit. And I made a pasta dish with it, and I loved it. Want the recipe? It’s got a No Pine Mouth guarantee, after all. While the pasta is boiling, make the spinach pesto: In a food processor (or a blender in a pinch), pulse the spinach, garlic, walnuts, olive oil, and Parmesan cheese. Don't pulse it to a paste - leave it a little chunky - some texture is good. Okay, now pick your track! Are you going all veggie, all carnie, or a split between the two? Wash the mushrooms, then remove the stems and dry. Remove the gills if you want - personally, I'm fine with 'em left on. Lay the mushrooms top side down in a shallow bowl or pan, and drizzle with the 2 tablespoons balsamic vinegar and 2 tablespoons olive oil. Season to taste with salt and pepper. Let the mushrooms marinate for 10 - 15 minutes. Slice the portobello mushrooms into strips. In a large saucepan, heat 2 teaspoons olive oil. Saute the portobello on medium high until it the edges start to brown - about 10 minutes. Remove portobellos from pan and remove pan from heat. Let cool. 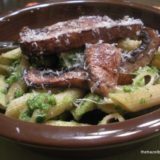 Add pasta to pan, toss it a bit (picking up a little bit of the flavor from the portobellos), then add the spinach pesto and toss. 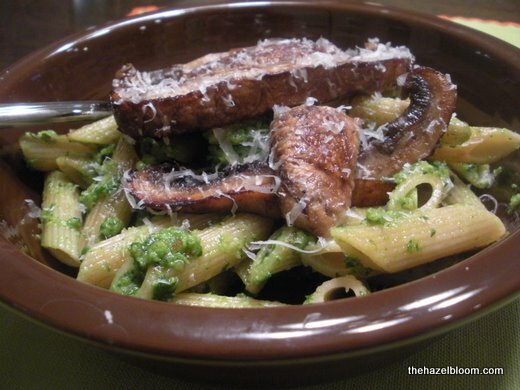 Plate the pasta with pesto, and lay the portobello strips on top. Top with a little fresh-grated Parmesan for extra goodness. Cut the bacon into pieces. Cook bacon in a frying pan until done - about 7 minutes. Turn off the heat, remove the bacon from the pan and place it on a paper towel to drain. Let the pan cool for a few minutes, then wipe the grease out of the pan. No need to wash it, unless you really want to - it'll add a little extra flavor to the pasta. Return the pasta to the pan (do not turn the heat back on - I'm just trying to save you a dish by having you mix the pasta and pesto in the cooled pan), then add the pesto, and toss. Top with bacon and fresh grated Parmesan cheese. Wash the mushrooms, then remove the stems and dry. Remove the gills if you want. I usually leave them. oil. Season to taste with salt and pepper. Put two medium-to-large frying/saute pans on the stove. Add 1 teaspoon of olive oil to one of the pans and heat to medium. 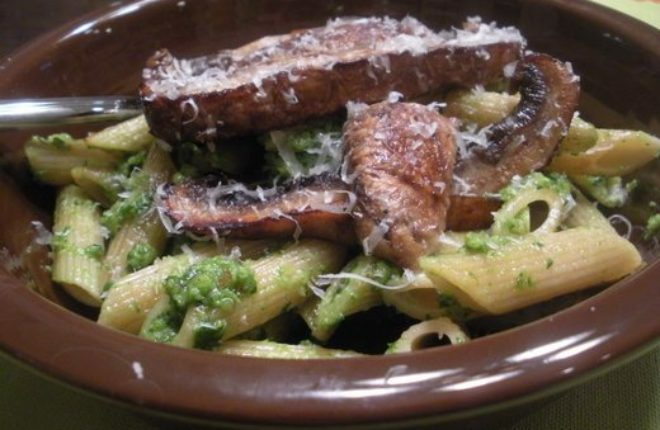 Slice the portobello mushroom into strips and add to the pan with the olive oil. Cut up the bacon, and add it to the other pan. Cook both the mushroom and the bacon on medium for 7-10 minutes. The bacon may be done a minute or two earlier than the mushroom. Remove bacon from pan to a paper towel for draining, and turn off heat.Remove portobello from pan and turn off heat. Allow pans to cool for a few minutes. Wipe the bacon grease out of the bacon pan. Split the pasta between the two pans. Split the pesto between the pasta in each of the two pans (veggie version in the mushroom pan, carnie version in the bacon pan), and mix well. 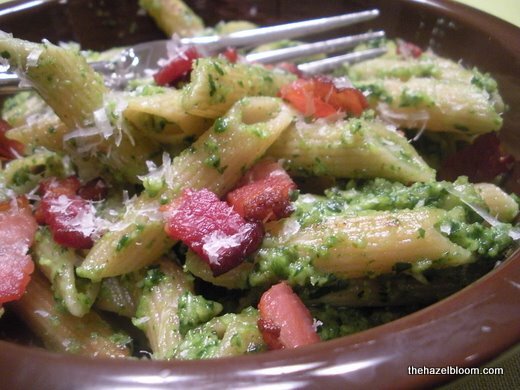 Pesto is best mixed into the pasta when the heat is off, so best to leave the heat off! We really need to clean our stove. And get new pots and pans. Plate the veggie version and lay the mushrooms on top. Top with fresh grated Parmesan cheese. Plate the carnie version and sprinkle with the bacon. Top with fresh grated Parmesan cheese. Voila! Veggies and carnies can live together!